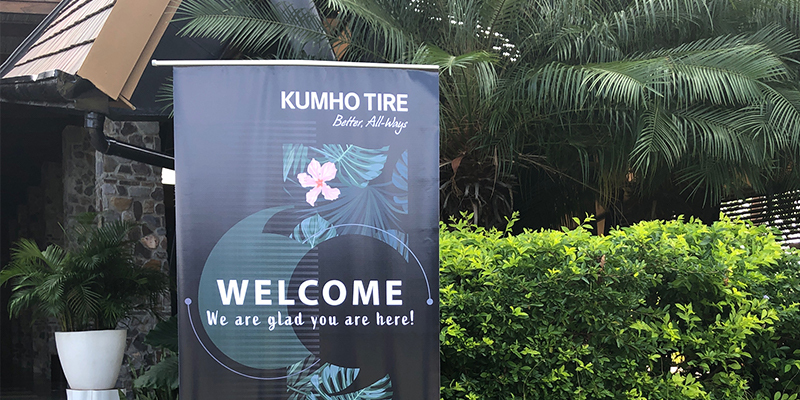 Amid the tropical landscapes of the Costa Rican coast, Kumho Tire USA hosted more than 30 tire dealers, distributors and their guests to not only update customers on what to expect from the company in 2019 but also to say thanks for their commitment to the Kumho Tire brand. 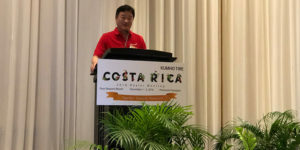 Kumho held its 2018 dealer meeting at the Four Seasons Resort Costa Rica at Peninsula Papagayo, where dealers learned about the company’s strategy for 2019, which puts a major focus on its partnership with independent tire dealers. During the four-day trip, Kumho treated dealers to excursions from ziplining to snorkeling and allowed for much-needed relaxation at the resort’s spa, two pools and two beaches. 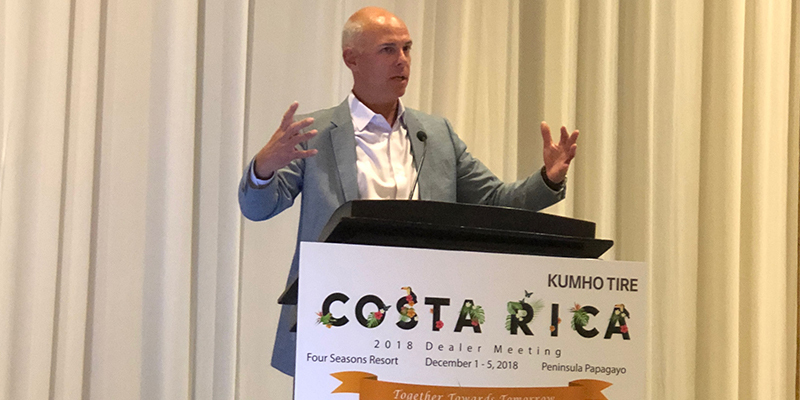 During its dealer meeting, Kumho emphasized how it will cut down its product offerings to better streamline its tire lines, work to grow its OE side of the business and further study its position in the market to enhance dealer profit margin. According to Kumho’s statistics, 61.5% of tire retail is done through independent tire dealers. 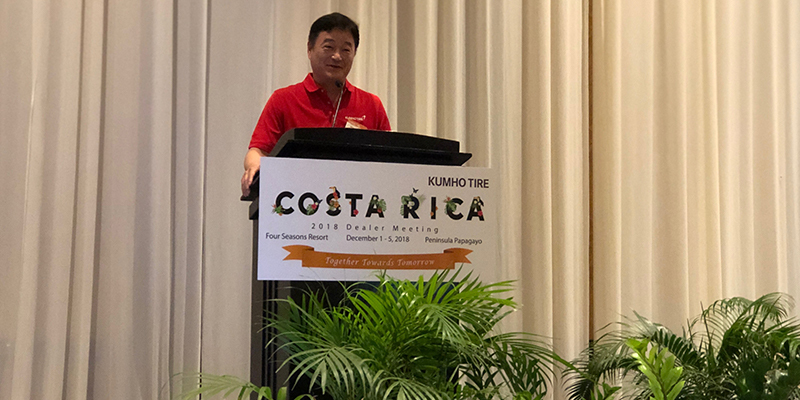 Harry Choi, CEO and President of Kumho Tire USA, addresses dealers and distributors at Kumho’s 2018 dealer meeting in Liberia, Costa Rica. To better cater to dealers, Denlein said the company will consolidate its product lines. After releasing about 10 new products from 2015 to 2016, Kumho will eliminate five to six lines this year to streamline its offerings. Already, the company has taken its light truck/SUV offerings—the Crugen KL33 and the Ecsta STX—and replaced and consolidated them with the launch of the Crugen HP71 earlier this year. It did the same with its UHP and HP offerings—the Ecsta 4x and Ecsta PA31—with the release of the Ecsta PA51. Shawn Denlein, senior vice president of sales and marketing for Kumho Tire USA, describes how Kumho will streamline its product lines. In the future, the company also plans to pare down its offerings in the grand touring, summer UHP and mud-terrain segments, Denlein said. In 2019, Kumho will consolidate its offerings in the extreme summer UHP segment with the release of the Ecsta NV720. The Ecsta KU36 and the Ecsta V720 will be discontinued. Both of Kumho’s summer UHP offerings, the Ecsta PS91 and Ecsta PS31, will be replaced and consolidated with the release of the Ecsta PS72 in 2020. In the mud-terrain category, Kumho will discontinue the Road Venture MT51 and Road Venture KL71 in 2020 and launch the Road Venture MT71. The Solus TA71 and Solus TA31, both in the grand touring segment, will be replaced with one offering: the Solus TA51, set to launch in 2021. In July, Chinese tiremaker Qingdao Doublestar acquired a 45% stake in Kumho for about $566 million, becoming its majority shareholder. When discussing the acquisition, Denlein said Doublestar’s investment provides the company with stability moving forward. It also gives the company much-needed capital for future projects including product and technology development, while it still maintains its independence. Denlein said both companies are focused on growing in the Chinese market, where Doublestar already has a presence. “The synergy in China is really the first area that’s being explored with the companies together,” he said. Moving forward, the company will explore more synergies, including in logistics and cost-saving moves. Denlein said Kumho is working toward collecting and studying market data internally to understand where its product is positioned in the marketplace. Through this, it hopes to improve their dealer’s profit margins. In the third quarter this past year, Kumho started to move away from special pricing requests and is currently studying the feasibility of a MAP pricing strategy. In the coming year, the company will roll out simplified dealer programs, including a more straightforward FUEL Associate Dealer Program with fewer components to allow for easier tracking of dealer’s progress. Kumho has also streamlined its dealer support resources. 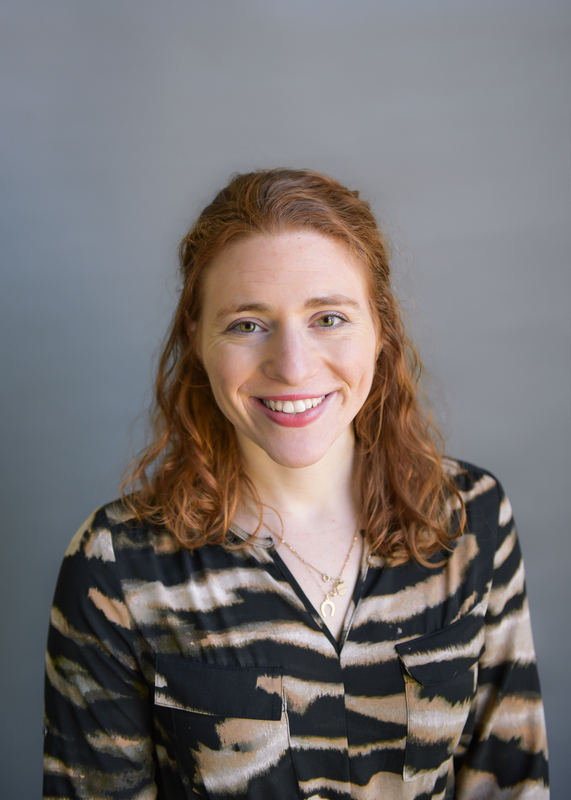 Internally, it restructured its sales team into two parts: a marketplace intelligence team, which tracks the company’s pricing in the marketplace; and its sales planning team, which works on pricing and programs. Denlein said the sales and marketing teams will also increase their focus on geo-marketing, which allows the company to show its dealers tire retail trends in their local markets. Global partnerships with key car manufacturers have fueled Kumho’s presence on the OE side. In the last 10 years, Kumho’s OE fitments have more than tripled from 12 in 2009 to 61 coming on board in 2019. In recent years, Kumho has focused on OE partnerships with Korean companies, such as Hyundai. The company is looking to move forward with more OE fitments on Japanese vehicles and others with high-inch fitments. “We have established relationships along the way, and we have a good collection of OE (fitments) in our portfolio, which is important because it has dealer pull through with the brand,” Denlein said. Social media and digital advertising is where Kumho Tire will focus its future marketing efforts and brand awareness campaigns, Denlein said. 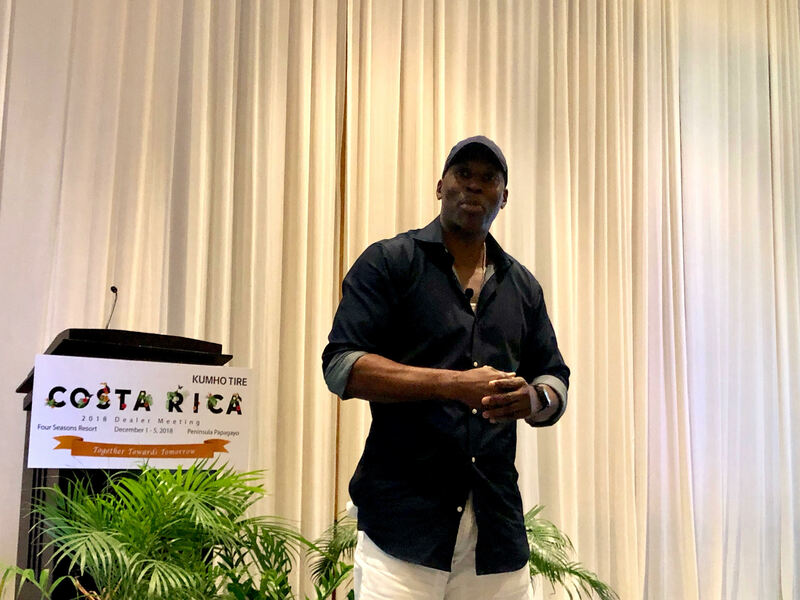 Kevin Willis, former NBA star, shares his experience in professional basketball, business and philanthropy with dealers and distributors at Kumho’s 2018 Dealer Meeting in Liberia, Costa Rica. With a hefty following on Facebook, Twitter and Instagram, Kumho has increased its brand awareness, especially among consumers under 40 years old, according to the company’s statistics. Based on company data, the brand plans to target customers between the ages of 18-34 that own or lease vehicles in its 2019 marketing efforts. To do that, Kumho is leveraging its partnership with the NBA, creating commercials featuring Washington Wizards point guard John Wall. It also sponsors a “Handles of the Month” video that runs on the NBA’s social media platforms which showcases a stellar play from a game during the month. At the dealer meeting, Kumho brought in retired NBA player Kevin Willis, a standout with the Atlanta Hawks from 1984-1994 who won an NBA championship with the San Antonio Spurs in 2013. Willis shared stories about his time in the NBA with dealers and also spoke about his fashion brand and philanthropic efforts. Kumho will continue to partner with the NBA in 2019 to create regionally targeted social media posts on the league’s Facebook page. Denlein said his team is also working to research engagement with regionally targeted social media posts to increase brand awareness and drive consumers to local retail stores. Nationally, Kumho is also using social media influencers and creating lifestyle videos to increase brand placement and recognition. Some of its influencers include Atlanta-born rapper T.I, Los Angeles Rams wide receiver Brandin Cooks and professional racecar driver Collete Davis, who Denlein says has a strong following among women in the automotive segment.